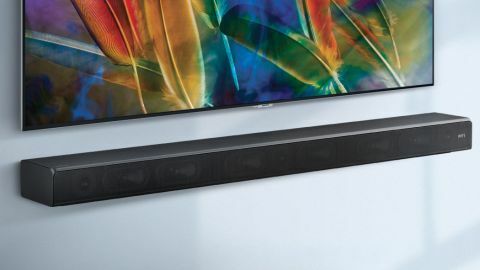 Samsung is arguably king of the TV at the moment, and the Samsung HW-MS650 soundbar is part of its bid to become the number one audio brand for home entertainment as well. By collecting talent from some of the biggest names in hi-fi players, creating a no-expense-spared audio lab in California, and establishing close working relationships with key players like Dolby, it's been able to deliver best-in-class results in the forms of the HW-K850 and HW-K950 Dolby Atmos soundbars. And as we've said, the Samsung HW-MS650 soundbar we're reviewing here is the culmination of these efforts and remains one of the best that Samsung has ever produced – even if it's getting older by the day. While Samsung's newer models for 2018 – namely the Samsung HW-N650 and Samsung HW-N400 – are both well-made, good-sounding products, they can't hold a candle to the MS650. For our full thoughts on what we think is one of the best soundbars ever made, read on. The HW-MS650 is one attractive soundbar, with no-nonsense, suitably serious rectangular sculpting. Add to that the brushed finish on the top, and the industrial-style grille over the speakers, and everything harmonizes together beautifully. The little slope down from the top edge to the speaker grille gives the entire design consistency, and we're pleased to see that the brushed top plate doesn't cause too much reflection from the screen it's likely going to be sitting below. Note, though, that at 78mm the sound bar stands quite high – high enough, in fact, to obscure the bottom of the picture, if sat directly in front of one of Samsung's own Q9F QLED TVs. It's also high enough to obscure an IR sensor on some other makes and models. If you’re going to rest the soundbar on the same bit of furniture as your TV, you should definitely measure how high your TV sits (and where its IR receiver is located) before committing to the MS650. That said, at least Samsung includes VESA mounting points for attaching the MS650 to the wall, and a TV power loopthrough feature that means you can use just a single plug socket to power both the soundbar and your TV. The MS650's other connections include a 4K-capable HDMI loopthrough system, optical and auxiliary audio inputs, an output for adding an optional subwoofer, and support for both Bluetooth and Wi-Fi wireless streaming. A second HDMI might have been nice in an ideal world, but you could always route multiple audio sources to the soundbar via your TV's audio output options if you needed to. We'd expect you'll be using your soundbar in wired mode most of the time, but check out the HW-MS650's wireless options too: you can stream from both Bluetooth devices and via Samsung's multi-room app (which works with a host of services like Spotify, Deezer, Tidal, Amazon Music, TuneIn and Pandora). If you prefer the Samsung HW-MS650 Soundbar can also be paired with Bluetooth headphones or other Samsung wireless speakers as part of a cable-free home network audio solution. For true surround sound, get a hold of the Samsung SWA-9000S speakers as well. The MS650's one-body design delivers a 3.0-channel (left, right, center) configuration via a startling combination of six woofers and three tweeters, each powered by their own individual 20W amps. The tweeters are the same wide-dispersion ones used so effectively on the K950 Atmos soundbar to expand the listening 'sweet spot' to accommodate more seating positions. It's with the HW-MS650 soundbar's innovative distortion-canceling technology that this tech starts to get really interesting though, helping it to achieve bass levels much deeper than you would get from a standard speaker design. Samsung's specs sheet suggests the MS650 can hit frequencies as low as 40Hz – but during our tests it actually managed to get even deeper than that. The Samsung HW-MS650 ships as standard with a Dolby Digital 5.1 decoder on board, down-converting multi-channel inputs to its 3.0 speaker configuration unless you add an external subwoofer and Samsung's wireless rear speakers. As with Samsung's K950 and K850 soundbars, at launch the MS650 received DTS multi-channel mixes in stereo, before using processing to create a virtual center speaker channel suited to its 3.0 speaker array. Proper multi-channel DTS decoding was later added via a firmware update, we're pleased to report. We'd also like to mention the many audio file formats that the Samsung HW-MS650 Soundbar is capable of dealing with: AAC, MP3, FLAC, WAV, OGG and ALAC are all on the list. As soon as you fire up the MS650, it becomes apparent that all that talk of non-linear control and distortion-canceling technology is much more than just marketing hype. In fact, the MS650 is the best all-round single-body soundbar we've heard to date – yes, it's really that good. Starting off with movie playback, the scale and attack the HW-MS650 Soundbar delivers with a powerful film soundtrack is outstanding for a three-channel system – especially when you select Surround mode, which expands the height and width of the soundstage into a fantastic 'wall of sound' – and all without diminishing the vocals or making special effects and heavy bass moments sound overwhelming. The scale of the MS650's sound is significantly boosted by a bass extension so impressive that it's difficult to believe it comes from a one-body speaker: what sorcery is this, Samsung? It works flawlessly even if the speaker is sat on a table (rather than being suspended on a wall) and, even more remarkably, this bass never overwhelms the rest of the sound, or leaves you with any sense of a gap between mid-range and low frequencies. While the Samsung HW-MS650's 3.0-channel speaker system isn’t capable of delivering any real sense of surround sound information, you can always add optional extra rears to the MS650 in the future if you really decide you want them. Another huge benefit of the soundbar is the way the verticality of its output makes vocals seem more 'attached' to the pictures coming from screens sitting above it, compared with similar devices. Soundbars that excel for movies don't commonly also deliver the goods with music, but the MS650 is the exception that proves the rule. To begin with, the timing is excellent, delivering a much wider dynamic range with music than you customarily hear with soundbars. Its smooth, rich bass handling is to the fore again too, hitting beautifully musical depths without sounding in any way forced, billowy or baggy. The MS650 even manages to deliver not just the full bass depth of Lorde's Royals, but also the sense of swelling and expansion that song's bassline deploys (if you know the tune you'll know what we're talking about). Listening to music also makes you aware of just how easily the sound escapes and expands from the speakers – there's no hint of muddiness or swallowed tones here. This enables its music to fill a large room even at fairly moderate volumes, so that you can be enveloped in sound without needing to push the fantastically robust drivers to anywhere near the sort of volume where they might start to sound strained or uncomfortable. Detailing is strong too on the Samsung HW-MS650 Soundbar, we found. We were able to pick out subtle harmonies, breathing and other small audio elements during high quality recordings that only the best music players can reproduce well enough to make you aware of them. The balance of the sound seems judged almost to perfection, with no part of the music – vocals, bass, drums, snares, synths – standing out too much from the mix. And finally in the plus column, we were pleasantly surprised by how adaptable the MS650's musical qualities are, as it handled pretty much every musical genre we played with equal tenacity and precision. That’s not to say the MS650 is perfect. High-end hi-fi fans may feel its presentation with very delicate tracks such as Nick Cave's Distant Sky is a touch too aggressive, while its focus on creating a wall of sound also means its stereo presentation is a little narrow for music. Also, amazing though the MS650's bass performance is for a single-box soundbar, inevitably a few high-end soundbar/subwoofer combinations can go deeper still. However, we feel that while there may be one or two soundbars out there from hi-fi brands that deliver music with a little more delicacy, and soundbar-with-subwoofer combis that can deliver even more bass, the bottom line is that no single-body sound bar has sounded as brilliant with both films and songs as the Samsung HW-MS650 Soundbar does. If you’re in the US, the MS650's $449 price looks remarkably good value for such a cutting edge and high performance soundbar. Given the US price though, it's a little tricky to understand why the MS650 should cost £599 in the UK. That said, once you’ve taken into account the quality and flexibility of its sound, and the innovative technology it uses to deliver that quality, the price still holds up well against the soundbar competition on both sides of the Atlantic. If you want more detail in the wall of sound your soundbar can produce, £300 more gets you to Samsung's K850 system, with its extra up-firing speakers. The K850 ships with an external subwoofer, though, which might not suit everyone. If you want to spend less and value music playback over movies, you could also consider the $399/£329 Q Acoustics M4. While music on this device sounds outstanding for the money, it's much more restrained with film audio than the MS650 is. Samsung has rewritten a lot of the rulebook with the HW-MS650 Soundbar. No other one-body soundbar has combined so much raw power with so much clarity, scale and (especially) bass, or excelled so consistently with both films and music. It's the sort of performance that only genuine audio innovation can deliver – and with that in mind, it's well worth its £599 price tag. The MS650 produces unprecedented amounts of bass for a single-body soundbar as well as a huge but cohesive soundstage. This makes it a superstar movie performer – yet while most soundbars only excel with movies or music, the MS650 is almost equally brilliant with both types of audio experience. It also looks good, and offers plenty of source flexibility as well. Hi-Fi fans would appreciate a little more stereo definition and delicacy with relatively quiet, minimal music, and the MS650's slightly tall design could be a problem for TVs that sit very low on their stands. There are no major drawbacks that would seriously put us off, though. Samsung's apparent 'money's no object' bid to establish itself as a serious audio brand continues to deliver the goods. Just as the K950 Dolby Atmos system reached new standards for the soundbar plus rear speakers and subwoofer market, the £599/$449 HW-MS650 Soundbar sets a new bar for the one-body soundbar market. Its bass performance is unprecedented, the scale of its sound is remarkable, and its ability to switch between movies and music is superb as well.